Combine harvesters are becoming increasingly popular on farm machinery. And technology of Combine harvesters has the potential to revolutionize the way we do plenty of things by using one machine to harvest, thresh, and clean grain all in one pass over the field. As demand for combine harvester data rises, today we’re going to take a look at the best combine harvesters recommended by experts in 2019. Prior to the combine harvester, farming was limited by manpower. From sowing and harvesting the crop, combine harvesters have an important role to play in the field preparation, planting and harvesting. Combine harvester allows farms to grow much larger, it is important to identify exactly what your goal is before you buy so you can find the models that best aligns with your needs. After all, these combine harvesters require a significant investment of both time and money. The demands on technology nature and human labor are rising more production must take place in a shorter time with fewer resources. Producers have asked the industry for more farm machinery innovations including this combine harvester. It's time that those demands are recognized and a solution is engineered. It's time for a new level of harvesting efficiency. Precision farming is key to harvesting efficiency. A residue management is extremely important. Continue reading to learn top 5 combine harvesters and to see if they are a good fit for your farmland. Figure out where you are, where you want to go and how much time and cost you are willing to spend to get the combine harvester. Check out several different combine harvesters and compare price, features, and service. 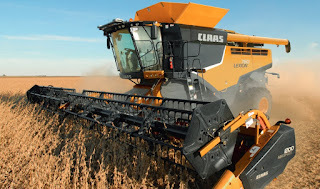 All new 700 series Lexion combines feature all new engines Tier 4 final engines. They also feature new feederhouse drives. We've got a new high heavy-duty feederhouse drive that's rated up to 268 horsepower which will accommodate the largest chopping cornheads available on the market today. Farmers have been asking for it and so Lexion is now providing that very large heavy-duty feeder house drive additionally with the engines. Claas Lexion 700 Series have a new dynamic cooling system. And dynamic cooling system is horizontally placed above the engine. It pulls air from the top down where it is coolest and cleanest and pulls it through the radiators and then expels it through the vents on the side of the combine - forcing dust and debris away from the combine to keep the entire cooling system and air filter clean longer. Claas Lexion 700 Series also have new rear axles. We've replaced the traditional hydraulic rear will assist with outboard with a mechanical rear will assist featuring outboard planetaries. We have a central hydrostatic ated in front of the rear axle so it has reduced the complexity increased tractive power by 33% and without any change in ground speeds. So when you engage the new mechanical rear will assist, you will not feed the combine will not slow down. You'll maintain two-wheel drive ground speed with four-wheel drive action.In addition to the new mechanical rear wheel assist also on the class 9 and 10 combines the 760 and 780. It features a suspended rear axle. 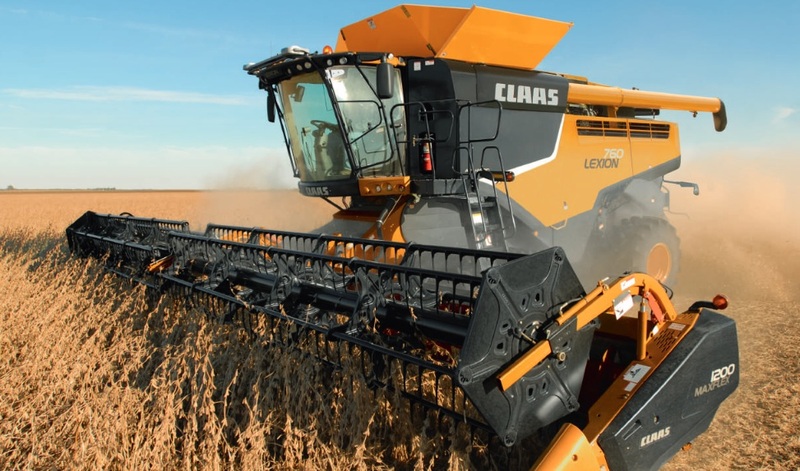 Claas Lexion 700 Series still allow the rear axle to pivot like previous axles but with the canoe connecting arms not only does a pivot but it shifts side-to-side and that greatly improved steering efficiency and turning radius. The turning radius has improved on all combines for the new 700 series. The new Lexion is equipped to communicate with many precision AG products so your operation can run smoothly and efficiently. Customers throughout North America demand more performance and capacity. Claas has broadened their range of high-capacity combines by adding the new Claas 10 Lexion 770 with 523 horsepower. With working widths up to 40 feet the Varia line of headers are ready to take on multiple small grain crops. The intelligence and innovation of the new Lexion allow customers to further optimize their machines through performance and efficiency. Embodying DEUTZ-FAHR's many years of experience in harvesting and its ongoing commitment to developing new technologies, processes and machinery, the C9000 Series consists of four models: C9205 TS, C9205 TS B, C9206 TS and C9206 TS B. These machines combine outstanding productivity with extraordinary versatility (for large area applications), an elegant design and incredible functionality, for .unparalleled harvesting performance with all types of crop. With powerful engines, superlative fuel consumption and unbeatably low running costs and simple maintenance, the C9000 Series is truly remarkable. DEUTZ-FAHR has developed a state of the art threshing system for the C9000 Series of combine harvesters. This is a robust, reliable and highly productive threshing system that handles the crop delicately during grain separation, to ensure extraordinary levels of crop quality. The system already achieves a high degree of gain separation between the threshing drum and the concave to reduce the workload on the straw walkers, increase productivity and handle the straw more delicately. The turbine works in conjunction with the double step system to clean enormous quantities of crop; while the crop is fed back to the grain pan for maximum grain protection without overloading the threshing system. The very long grain pan moves with a reciprocating motion to ensure perfect stratification of the chaff and straw. As these two components are lighter than the grain, they are blow away immediately upon contact with the air flow produced by the turbo-ventilator, for more effective cleaning of the finished product. The grain pan is easily removable from the combine harvester, minimising maintenance times and simplifying the operations needed to reconfigure the machine for a different crop. The grain tank of C9000 Series machines has a 9,500 litre capacity and is emptied with an extraordinarily high speed discharging system, with powerful motors capable of discharging the tank effectively while working and without stopping the machine, eliminating time wastage and lost productivity. The level in the tank is observable via a window in the cab, while the threshing quality may be checked via an external grain sampling hatch. An indicator light and an audible warning signal activated by two sensors in the tank inform the driver that the tank is full, and that it is necessary to start the discharge procedure. Engine Hydraulic Transmission The engine of a combine harvester must also be capable of powering additional or optional accessories, and must have a sufficient torque reserve to maintain maximum productivity even in the most challenging conditions, with no loss in threshing component speed. Modern 4 valve per cylinder, 6 cylinder DEUTZ Common Rail TCD 6 7.8 l Tier IIIb engines offer the perfect solution for this specific application, and combine outstanding power with extraordinary efficiency, for superior threshing performance with optimum fuel efficiency and productivity. It's a way of life and it's constantly evolving day after day, year after year. John Deere is looking for the best way to harvest with the most advanced and most productive combine in the industry. A harvesting system like no other history repeating itself in a good ways with maximize performance and reduced cost. The John Deere s-series combine. This exclusive John Deere feature means you get innovative knockout performance when you're harvesting window is short and time is of the essence. Sound high-tech well it is ProDrive sustains high levels of performance because there's no gear shifting while harvesting. The HarvestSmart feature integrated into the ProDrive transmission adjust your forward speed. You know what I'm talking about, let's just say it's optimized for maximum capacity minimal loss, Go Green, save green. One button can expand your harvesting day by adjusting your platform tilt to match your changing crop conditions. Here's the angle run longer, adjust easier, when here's the words you didn't expect general you heard right but only when it comes to threshing. Thanks to John Deere rotor technology. You get gentle threshing for excellent grain quality how does this happen you ask from try stream feeding from the spiral veins and conical top covers around that rotor and from the bullet-shaped rotor. The rotor technology gives you reduced power consumption which means less operating cost. It's simple. All about integrated solutions. John Deere farm site boosts productivity to get every dollar from every hour and every acre. When quick decisions about farm management need to be made farm site is on your side. Take combine harvesting to the next level harvesting season wouldn't be harvesting season without your right-hand man. Your John Deere dealer knows his way around a combine and then some and it understands how to get the resources you need because it's fast efficient and professional. 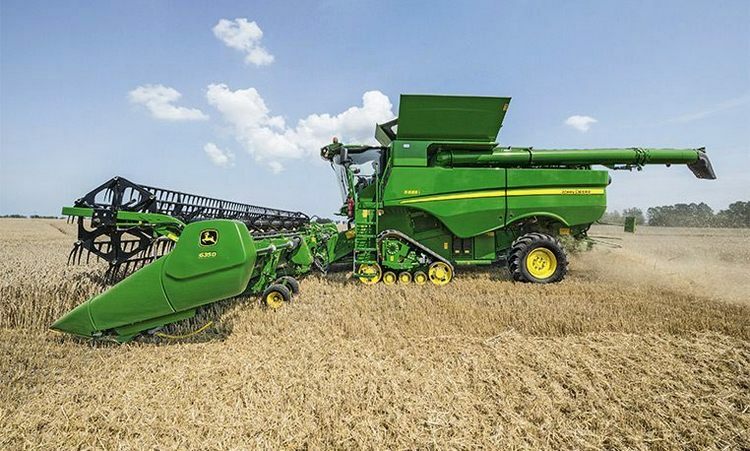 The new John Deere S-Series not only increases your productivity and efficiency but also improves the quality of your grain and straw – and that’s something you can rely on in every situation. If you have rolling terrain in your field and need to go uphill or downhill frequently, Active Terrain Adjustment automatically adjusts fan speed, chaffer position and sieve position. The CR10.90 is powered by the Fiat Powertrain Technologies (FPT) Cursor 16 diesel engine. Compliant with Tier 4B emissions regulations, the CR10.90’s engine incorporates ECOBlue Hi-e SCR (high efficiency selective catalytic reduction) technology on a hydrostatic drive transmission. The award-winning 16-litre engine pumps out a massive 653hp (487kW) putting the CR10.90 into the Class 10 category for combines. Most of the credit for the high output of the CR10.90 can be attributed to its massive engine, new dynamic feed roll system and 22-inch (56cm) twin pitch rotors. Massive Crop Capacity: The CR10.90 has the largest internal crop tank of any harvester, at 14,500 Liters. Powerful: The CR10.90 has the highest Horsepower with 653hp. It is as strong as the strongest Tractor, and capable of pulling very heavy weight when necessary. Very Fast: The CR10.90 is the fastest of all harvesters. It is as fast as a super-large Tractor, and can move itself and its header from field to field without much delay. Thanks to its Crawler Track, it can also brake very rapidly. Enhanced Case IH Axial-Flow 140 series combines increase productivity, featuring an improved transmission and more standard features, making it easier to adjust to different crops and field conditions to produce higher-quality grain for increased productivity. The Case IH Axial-Flow 140 series consists of three current models, with the 6140 being the most popular. The series boasts the brand’s lauded residue management system, built to handle the tough residue associated with new crop genetics. With an engine that produces 348 horsepower and a grain tank capacity of 300 bu, this combine is an excellent choice for demanding farming needs. 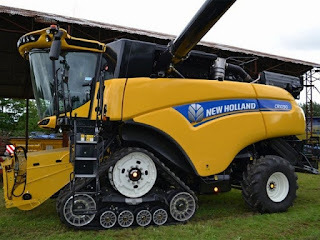 0 Response to "5 Best Powerful Combine Harvesters Recommended by Experts in 2019"